“Nature transformed through industry is a predominant theme in my work. I set course to intersect with a contemporary view of the great ages of man; from stone, to minerals, oil, transportation, silicon, and so on. To make these ideas visible I search for subjects that are rich in detail and scale yet open in their meaning. Recycling yards, mine tailings, quarries and refineries are all places that are outside of our normal experience, yet we partake of their output on a daily basis. Our times are defined by hyper-industrialization. Industry is extracting commodities – oil, stone, etc. – to produce products – electronics, vehicles, etc. – at unprecedented rates. Burtynsky’s work and corresponding books below capture these themes on a global scale. No nation or people is immune from his lens and the questions it ultimately poses. Burtynsky has moved into the medium of film as well. 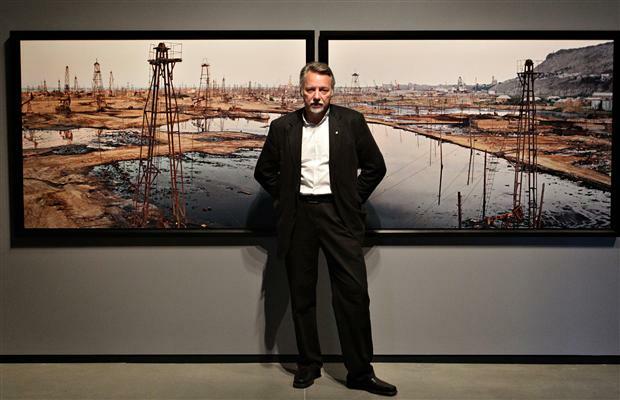 In 2013, Burtynsky released Watermark, a documentary he co-directed with Jennifer Baichwal. In 2006, Baichwal had made Burtynsky the focus of her film Manufactured Landscapes. Manufactured Landscapes highlights footage compiled from a trip to China where Burtynsky visited factories which Western society has come to rely on for most of its appliances, including a factory that produces most of the world’s supply of clothes irons, which is one kilometer in length and employs 23,000 workers. The film also features the Three Gorges Dam, which, along with being the largest dam in the world, has uprooted more than one million people and flooded 13 cities, 140 towns and 1350 villages since the beginning of its construction in 1994. Watermark features water use practices around the world, including multiple scenes in China and the United States, as well as segments shot in eight other countries. In China, the film chronicles the building of the Xiluodu Dam and flooding of its reservoir. Unlike most documentaries, these films feature very little commentary, which allows viewers to take in the images and try to make sense of what they’re seeing, while at the same time the film “tries to shift our consciousness about the world and the way we live in it”.